Availability: 1 female space now opened up for booking, otherwise sold out! Extended Trip Option for complete Iceland circumnavigation: There is an option to extend your trip a few days to include the Snaefellsness Peninsula and northern Iceland complete circumnavigation of Iceland and the opportunity to visit additional regions around Iceland and experience different weather. Dates: 5-9 March 2017. Learn more and book instantly on this extension's trip page . This unique 11 day / 11 night photography expedition features the classic itinerary of the south coast till the Vatnajökull glacier region including icecaves and Jokulsarlon icebergs, then through the remote Eastfjords, ending with a Northern Iceland and Aurora Borealis photography tour visiting the Myvatn and Akureyri region. Come explore the legendary land of fire and ice, from northern Iceland's Myvatn area, to classics of the South Coast waterfalls and the Vatnajokull glaciers, to the remote East Fjord region away from the tourist crowds and providing new exciting photographic destinations! Meant for outdoor photographers of all skill levels who desire to see and photograph Iceland's beauty in winter, on this tour you will experience dramatic mountain scenery, iceberg lagoons, black sand beaches littered with clear ice chunks, geothermal areas, ocean landscapes, waterfalls, and of course, unparalleled chances to view the Aurora Borealis in remoter regions of the country. We'll have a busy schedule, filling our days and nights with rewarding photography opportunities around the island, while staying in excellently situated quality accommodations at night. Read below for a detailed itinerary and further trip information. Read below for a detailed itinerary and further trip information. The trip begins with your included domestic flight from Reykjavik (city airport - not Keflavik) up to Akureyri, Iceland's 2nd largest town with just 10,000 people. You will be greeted upon arrival to the airport and picked up, and then have a short time to get settled in the hotel. Then we'll eat an early dinner at a popular restaurant in town, and then go out for the evening and through sunset to photograph around Eyjafjordur, Iceland's largest fjord. We'll photograph an Icelandic country church on the arctic ocean shoreline, and then choose to either photograph in the Trollaskagi Peninsula mountains or drive over to Godafoss for sunset. Later, and weather permitting, we'll go on a night/aurora shoot. We will photograph the famous geothermal areas of Myvatn lake and craters, Dimmuborgir and other lava formations, and possibly hike to Aldeyjarfoss. In the evening, we'll do possible nighttime or aurora photography over the Myvatn formations. Depending on the light, Godafoss waterfall is another option. Accommodations in Myvatn. On day 3 in the Myvatn region we'll photograph Krafla and Namafjall geothermal areas. We'll also see Dettifoss which is Europe's most voluminous waterfall (roads permitting), and then go out for possible nighttime or aurora photography over the Myvatn lava formations or Godafoss. Some say this is the best region in the country for viewing the Aurora Borealis, during the height of the spring solstice, which statistically has the most frequently occurring aurora borealis activity. Accommodations in Myvatn. After wrapping up our Northern Iceland photography, we transition over to eastern Iceland. We have a longer drive to the Eastfjord region, across desolate and barren snowy highlands, which hold their own photographic charm. Here, we'll take telephoto shots of the road winding through white wilderness. Accommodations will be in Djupivogur or a similar town. As we travel down the east coast of Iceland, we'll explore the Eastfjords coastlines, secret waterfalls, old abandoned bridges too narrow for modern cars, and more. The eastfjords offers many locations that are rarely visited by photographic tour groups, offering us the best chance for solitude and harkening back to years past before the current Icelandic tourist boom. Sunset at Stokknes Peninsula and the famous Vestrahorn mountains. Vestrahorn would also serve as our foreground for any possible aurora photography. Accommodations will be in Hofn. In Hofn, the morning will be spent at more spectacular glacial lagoons such as the remote Heinabergsjokull. We may revisit Stokksnes area and Vestrahorn. Then we wrapup our time in the Eastfjords, stop along the way to photograph friendly Icelandic horses and abandoned farm houses, and finally reach many photographers' favorite destination in Iceland, the famous Jokulsarlon iceberg lagoon. Sunset and possible aurora borealis night photography over Jokulsarlon. Accommodations near Jokulsarlon. This will be a full day spent at Jokulsarlon glacier lagoon and iceberg beach areas, as well as other nearby glacial lagoons such as Fjallsarlon. In the dark hours of each day, with epic glacial backgrounds and in dark places away from any artifical lights, we'll search the skies and wait to photograph the Aurora Borealis - always with phenomenal landscape backdrops and reflection potential. Accommodations near Jokulsarlon. Today is our 2nd full day in the Jokulsarlon glacial area, featuring a visit to the otherworldly glacial ice caves with a highly seasoned local guide, experiencing and photographing this phenomenon unique to Iceland -- exploring the stunning transluscent blue interior of the ice caves. This ice cave trip is included in the trip price. We are booked to go to a more remote, more beautiful, and less visited cave, likely the Waterfall Cave, compared to the overcrowded Crystal Cave which funnels through 500+ tourists per day making good photography there next to impossible, which is where most other photography groups go to nonetheless. (note: good physical fitness is required to access this remote ice cave - you have the option to downgrade to the easy-access Crystal Cave - please notify upon booking trip). We'll then spend the rest of the day and possibly night in the glacial lagoon regions photographing ice chunks washed up on the black sand beach, and icebergs in Jokulsarlon. Accommodations near Jokulsarlon. Even more glaciers await us around the Skaftafell glacier region, with plenty of photo stops at farms, waterfalls, Eyjafjallajokull, and rural country sights. During daylight hours, we utilize the low-angle sun to capture magic light even at midday. In the evening, we'll stay on the look out for a possible aurora over Svinafellsjokull glacier. Accommodations in Skaftafell. There's many little photographic gems on this section of Iceland's Ring Road, including authentic and abandoned grass-roofed turf farm outbuildings showcasing the old style of building. Also several waterfalls like Thorufoss are worthy or our time. We'll arrive at the Reynisdrangar Vik seastacks and Dyroleay headland area for sunset and possible aurora locations. Accommodations in Vik. On our last day, we'll continue photographing around the Vik area black sand beaches such as Reynisfjara, then continue now westward to Skogafoss and Seljalandsfoss waterfalls, which are among Iceland's most famous and visited waterfalls. Late in the day we'll return to Reykjavik, have a final group dinner and say farewell after our 11 day adventure together! Accomodations are included tonight, in Reykjavik. Plan to fly out the following day on your own. Group Size: Maximum size of 8; minimum size of 3. Start/End: The trip starts midday on March 11, 2016, with a late-morning domestic flight from Reykjavik to Akureyri, and the trip concludes on March 21st upon return via vehicle to Reykjavik. The trip cost includes domestic airfare to Akureyri from Reykjavik at the beginning of the trip (to be booked on your behalf once your international flights are booked on our own). We'll be so immersed in the Icelandic countryside for our entire time as a group, that we have left no time to enjoy the sights of Reykjavik, so we encourage you to stay in Reykjavik for a couple days on your own, either before or after the tour. Accommodation for 11 nights (in Icelandic guesthouses and country hotels; accommodation is based on double occupancy, single supplement fee may be added; most but not all rooms include private bath). Experience Needed: This tour is open to photographers of skill levels (because the guide can work with you at your own level), with a passion for being outdoors for long days and for rural country and landscape and austral photography interests. You will be sent a packing list and to get the most out of the trip and for your's and the instructor's sake it is requested you bring the listed photography gear. If you have additional questions, the trip leader will be happy to answer them over the phone or by email. This photo workshop is all about in-the-field field photography and situational instruction, working alongside your trip leader. Each day, the group will photograph diverse landscapes and natural wonders of Iceland, in the quiet and peaceful setting of the Icelandic wintertime. In the evening, we'll occasionally have image critiques and editing sessions on clients' laptops. We will always being prepared to go out to photograph the Aurora Borealis should it occur. Aurora Borealis viewing depends on 2 main factors: solar activity and clear weather. A long trip through various parts of the country gives us the best chances to see and photograph this phenomenon. Photographic topics that will covered while shooting include nighttime and austral photography, Aurora Borealis photography, classic landscape photography composition and technique, HDR (High Dynamic Range) imagery, panoramic photography, adventure and travel photography, and slow shutterspeed effects. Our full 11 days and nights of photography potential allow us to see a variety of well-known Icelandic natural wonders around Akureyri, Lake Myvatn, and the Snæfellsness Peninsula, and combined with austral wonderment, enable each participant to get the most out this once-in-a-lifetime trip. In good daytime weather and clear night skies, March days can be long; occasionally our groups are putting in 20+ hour days! A maximum group size of 8 photographers ensures you will receive ample personal photographic coaching in the field from a full time working pro, and provide an intimate small group adventure experience. 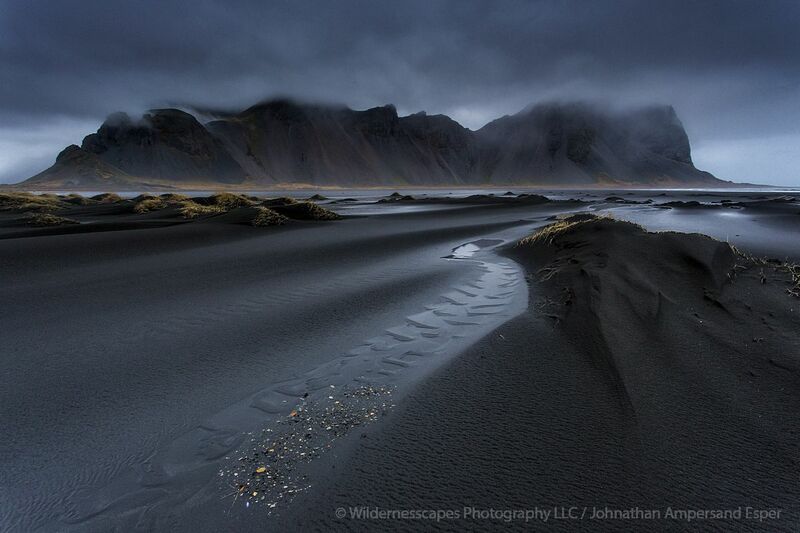 Johnathan Esper of Wildernesscapes Photography LLC, based in the USA, will be leading the trip, his 50th+ in Iceland. Johnathan is a full time photographer and international photo trip leader, and has a unique background and an intimate knowledge of Iceland from living out of a car, exploring and photographing Iceland intensively for months at a time. He specializes in wide panoramic landscapes and adventure photography in Iceland and the Adirondack region in the USA. Johnathan also sometimes collaborates in co-leading tours with other top names of Icelandic photography including Örvar Þorgeirsson and Iurie Belegurschi. Deposit: A $1000 deposit is due at the time of registration, and the remaining balance is due three weeks prior to the trip start. Until payment is sent, your place is not guaranteed. You may conveniently pay your deposit here (near bottom of page) securely with your credit card, processed by Paypal payment processor. The deposit portion may also be paid via personal or bank check for USA and Canadian clients. Refunds are allowed at the discretion of the trip leader in the form of future trip credit, depending on cancellation date. Please contact me if you need any assistance in signing up! Final Payment: The final payment for the balance due on the trip (after your paid deposit), is due three weeks prior to the trip start. Payment options include bank transfer to my Icelandic bank account (details on request), cash in person at the trip start (with prior permission), personal or bank checks (preferred for USA and Canada clients), and credit cards (a 2% credit card fee will be added for final payments with card). Cancellation Policy: In the unfortunate case if you need to cancel, cancellation policy is: Deposit payments are refundable as 100% future scheduled trip credit up to 120 days before trip start, 50% future scheduled trip credit if cancellation is 120-60 days before trip start, and non-refundable less than 60 days before start. Final payments for the full trip balance are 100% refundable as cash until the trip start, and non-refundable after the trip start. If I am able to fill your empty spot on the trip, half of what you'd lose will additionally be returned to you, for all the above situations. If I cancel the trip for some major reason, such as overwhelming volcanic activity, trip leader health crisis, etc, then I fully refund everything in cash or Paypal, or a pro-rated amount if the trip must end early for the same reasons. I am not responsible for reimbursing you for travel or other ancillary expenses you incur in prep for the trip.